Swimming is everyone’s favorite summer pastime. There’s just something about soaking in the sun and then taking a dip in a refreshing pool. However, there are also risks when young children are involved. How can we, as parents and guardians, better protect these precious assets and keep them safe? Let’s check out a few tips for the rest of this summer and beyond. Sadly, unintentional pool drowning deaths aren’t an anomaly. Hundreds happen each year and the vast majority of these deaths are totally preventable. 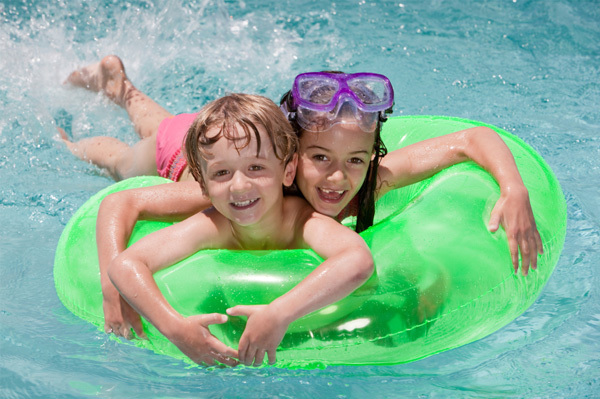 Unfortunately, most adults don’t understand the importance of equipping children with basic water safety skills and keeping pools protected from wandering children. It’s also important to recognize the signs of drowning. While movie clips and dramatizations of drowning have led us to believe that these are violent experiences, the truth is that drowning is actually a very quiet experience. Most children can’t call or wave for help, so here are eight signs to keep an eye out for. Swimmer’s ear is a painful infection that occurs in the outer part of the ear canal. It’s caused by exposure to bacteria that are often found in polluted pool water. When this bacteria becomes trapped in the ear, it often multiplies and causes symptoms like discomfort, itching, swelling, and decreased hearing. While many parents strive to prevent swimmer’s ear by using earplugs, this isn’t the best solution. Earplugs rarely keep all of the water out and may actually trap bacteria in the ear. “Instead, encourage your child to shake the water from his ears after swimming by tilting his head to one side and gently tugging his earlobes to help the water drip out,” suggests Parents.com. Furthermore, try cleaning out your child’s ears less often. Small amounts of earwax serve as a protective barrier and may actually keep bacteria from entering the ear canal. Our parents always told us to wait on swimming for at least 30 minutes after eating– and you, more than likely, tell your children the same thing. Is this just an old myth, or does it have some truth to it? Well, doctors say it’s actually sound advice. After eating, blood flow in the abdominal region increases in an effort to aid digestion. This draws blood away from muscles – especially the limbs – and may cause cramps. These cramps can make a child feel week and drowsy. In extreme situations, they can even lead to loss of consciousness. Better safe than sorry on this one – make kids sit for at least half an hour after eating. The diving board is one of the most fun aspects of the swimming pool, but it also poses a number of injury risks. In order to ensure children have fun and stay safe, it’s imperative that you establish rules. First off, only one child should be allowed on the diving board at a time. Second, children should never jump before looking and making sure there’s nobody underneath the diving board. It’s also smart to prohibit running and multiple bounces on the board. While the swimming pool comes with a number of inherent risks, it doesn’t have to be a dangerous environment for children. By establishing rules and being aware of your surroundings, parents and guardians can ensure kids remain safe. Make sure you’re doing your part to make this summer both safe and fun!